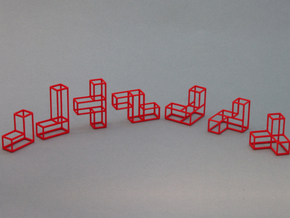 Roll a Ball on Plastic Rails Inside a 3D Cube – Reach the Exit to Solve the Maze Puzzle. New larger sizes for 2012. 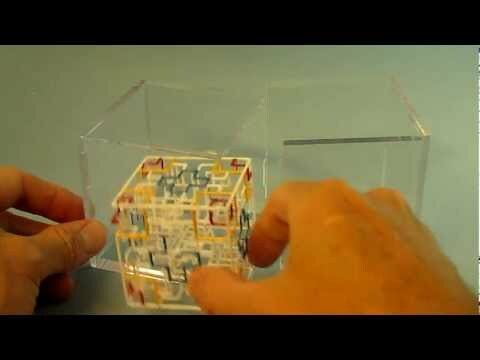 Rolling Ball Maze Puzzle & Brain Game. Color and material options are in the "Select Material" drop-down list on the right. If you want an option not shown or would like a quantity discount, please click on the "Contact Designer" button to write me an email.This pack includes the 2 mazes listed below. Each maze includes it’s own ball. Twisted Symmetry - The outer faces of the maze cube have an intricate symmetrical pattern, but the internal path has been so twisted upon itself that any hint of symmetry is lost to oblivion. There are plenty of dead ends in this maze so it is significantly more difficult than “Minotaur’s Castle”. This maze is also more difficult than “Escher’s Playground” because it has many more turns and a longer path. Minotaur’s Castle – In Greek mythology the half-man, half-bull Minotaur lived in a 2D maze called the Labyrinth. The “Minotaur’s Castle” now gives the Minotaur an upgraded 3D labyrinth to live in. “Minotaur’s Castle” is a classical variation of a labyrinth where there is only a single path through the maze. There are no dead ends. With no dead end this maze is only moderately difficult and significantly easier than “Twisted Symmetry”, which has no dead ends. However this maze has many more turns than “Twisted Symmetry” or “Escher’s Playground” so you will need to be careful or you can easily end up back where you started. The new larger size for these mazes make it much easier to see inside and keep track of where you are, and which way to turn next. 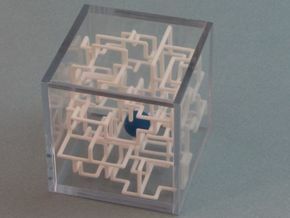 In addition to the larger size, these mazes have much thicker rails compared to smaller mazes such as “Escher’s Playground”. 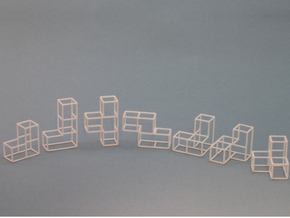 Even thicker rails are used for the frame along the overall outer edges of the mazes. These makes for a much stiffer maze. 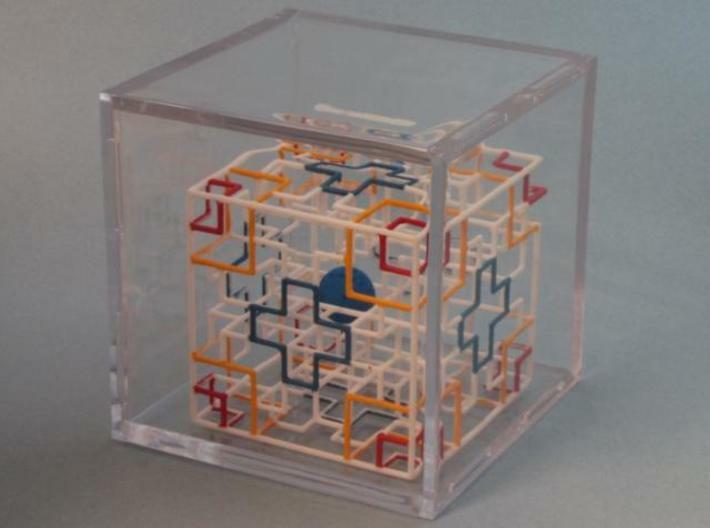 A symmetrical pattern has been incorporated into each face of the maze cube. You can make these patterns really pop out by coloring them. A quick and simple method is to use highlighter markers, or Sharpie colored markers. To make it a real work of art you can paint them. Use a small brush and the small bottles of enamel paint used for plastic models. Testors brand enamel paints were used for the painted models on this page. These are available at Michaels craft stores, or at hobby shops. 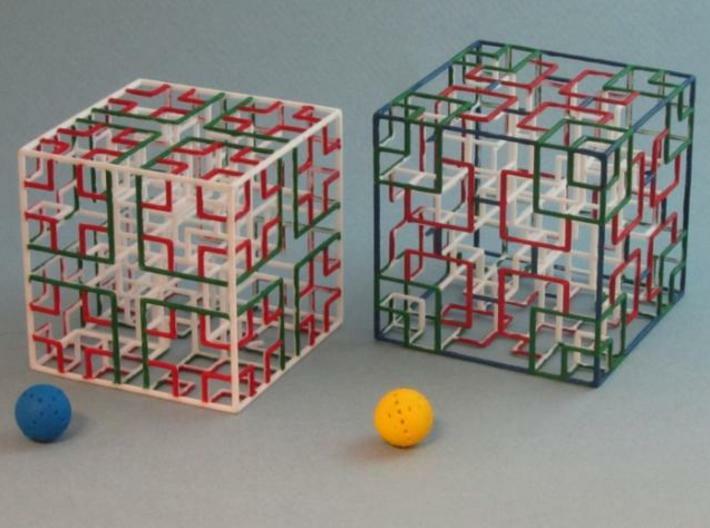 There are many variations of patterns possible depending on which sections of the rails you color, and which colors you use – this allows you to make your maze a unique work of art. Show off these unique Works of Art in a quality display case. The large size case is about $5 and is for "Twisted Symmetry" or "Minotaur’s Castle". You can see a picture of the display case with a maze inside in the photos above. Use the link below to get your Display Case with Free Shipping. I added a video showing how the entrance and exits work, and show “Minotaur’s Castle in action. 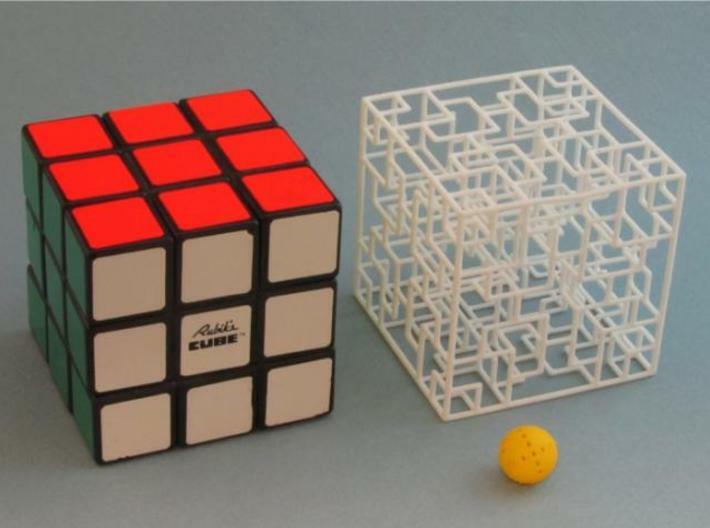 There are other videos of these maze in their individual product pages. 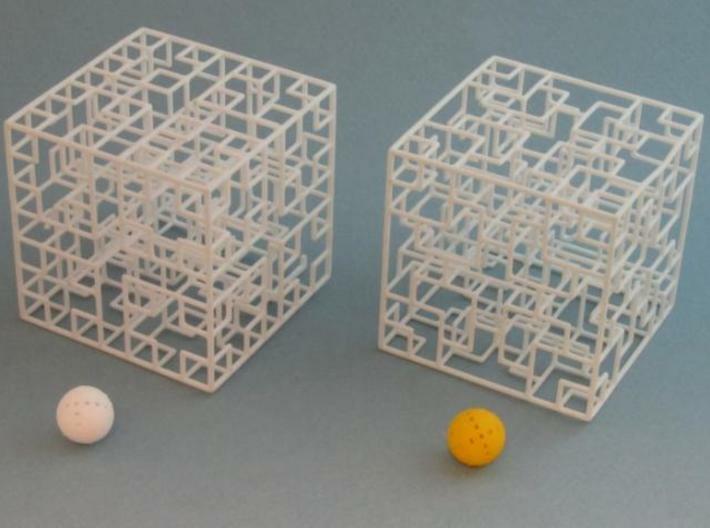 These show the new features of this maze and size compressions. You can view the first video right from this page. Just scroll up to where you see the photos of my mazes. By the right top corner of the picture there is a little movie camera icon right below the camera icon. Click on the Movie Camera Icon and you will see my video in the picture window. Just click on the play button to view it. 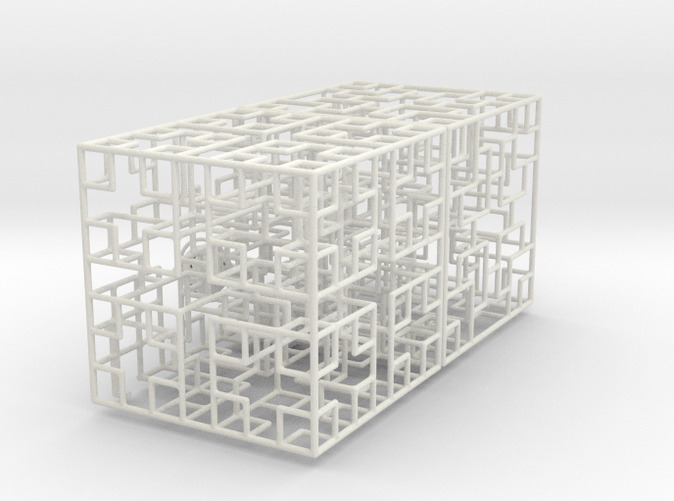 If you have any questions about my maze puzzles leave a comment and I will respond here. 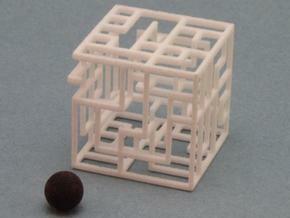 The dimensions of these mazes are 56mm wide on each side, or about 2 ¼ inches. 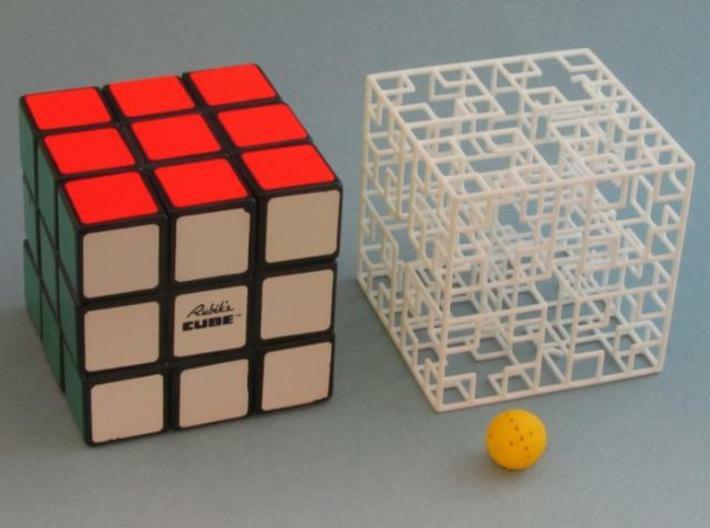 This is the size of a Rubik’s Cube.